Pimjai Intamoon has been in poor health since her childhood. She helped her parents doing their small business of iron work in her hometown of Mae Rim, Chiang Mai , Northern Thailand . She met her husband who was an alcoholic. She married him amidst the objections of her parents. After marriage for some time, she found out (at the age of 17) that she contracted HIV/AIDS from her husband. Her husband died in 1995. After getting HIV/AIDS for 2 years, she began to set up Home Care to help people who were living with HIV/AIDS. She visited those in need, those facing similar problems as her own. By working to help and serve other people in need, she found the meaning of life. She often says that, "She is glad to have AIDS, because AIDS makes her see the value of life." 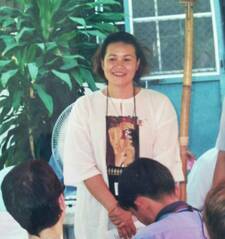 In 1993 she established a Project for Community Health at her parents' house, and helps those infected with HIV/AIDS. She offers basic medicines and counsels them to not hide themselves, but to reveal themselves and live a normal life. Pimjai Intamoon identifies the main problem of living with HIV/AIDS as the social stigma, the exclusion from society, the separation of HIV+ people from those with whom they live. She says, "If all persons infected with HIV/AIDS reveal themselves, the AIDS epidemic would cease to exist." At present, the Community Health Center has almost 1,000 members, coming from Mae Rim and other places. Pimjai Intamoon also analyzed the economic impact that HIV/AIDS has on peoples' lives, and therefore helped to set up a Drug Fund, a Savings Group Fund, and a Store for raising funds for those infected with HIV/AIDS. She supports them to create handmade products for export. Pimjai Intamoon is a living Bodhisattva, a precious daughter of the Buddha. Her presence at various meetings and seminars to campaign for those living with HIV/AIDS over the past decade has inspired people far and wide.